I am not one to typically open up a bunch of canned stuff and dump it all into a dish, cover it with cheese, and bake until done — but I do believe the casserole was invented to get rid of a bunch of stuff in the fridge! 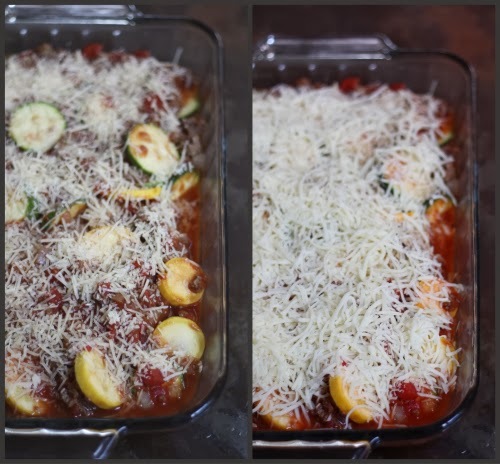 Hence this quite delicious casserole that's quick and easy to prepare for a busy week! 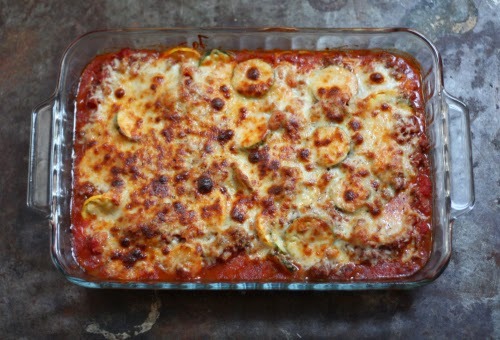 When I am making a casserole I do try to use the best quality canned ingredients, San Marzano tomatoes are an example that could be used in today's recipe. 1 1/4 pounds of ground meat (I used spicy sausage, but turkey, ground beef or chicken is fine). 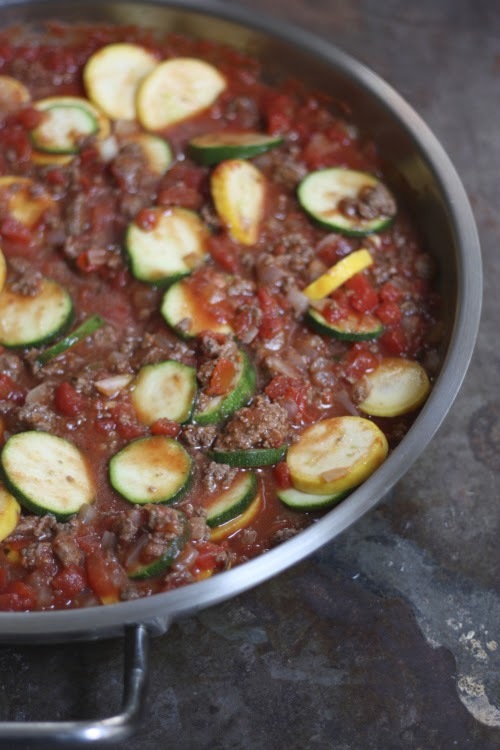 Heat olive oil in a pan, adding onions and meat; cook until the meat is brown and crumbly. 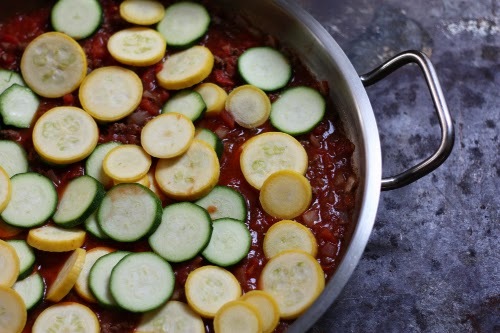 Add the 3 cans of sauces, salt and pepper to taste, mixing to combine, then incorporate in the squash and zucchini. Allow to simmer on the stove for about 10-12 minutes. Spray a casserole dish with a non stick spray and fill with the fragrant mixture. Top first with the parmesan and then the mozzarella cheeses. At this point you can cover the dish and save in the fridge for 1-2 days until you are ready to bake. Remove it from the refrigerator 20 minutes before heating to allow it to come down to room temperature. Bake uncovered in a 350 degree oven for 20-25 minutes until cheese melts and is bubbling. Serve with a side salad and enjoy the warm, cheesy and spicy goodness of this casserole. Also be thankful you were able to use up a few ingredients that had been hanging in the fridge and pantry! Tried this casserole. Just added a clove of chopped garlic to it. Wow! Loved how much flavor is had, and it was so easy to make. My kids liked it too. Getting my 5 year old to eat veggies is like pulling teeth, but she liked this dish. That makes me feel so good! Thank you for sharing that with me! Can hardly wait to try this! 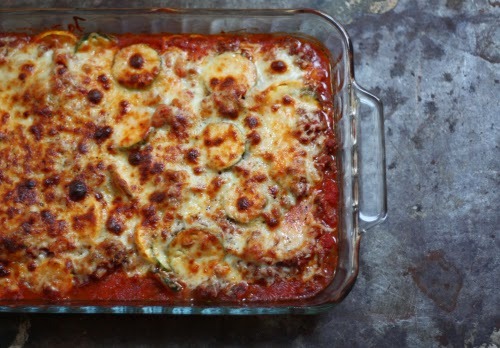 We LOVE zucchini and always tying to find new recipes for it! Thanks for sharing! Great Vicki! Cannot wait to hear how it turns out!